Order the Ultimate Guitar Song Collection Now! 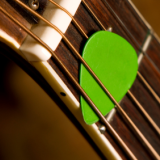 Do you love guitar, and wish you had a bigger repertoire of songs under your belt? to teach you some killer tunes! Have you ever been frustrated by hard-to-read song books, amateur tabs, and online misinformation? Do you struggle to "put songs together", or maybe just feel that it takes too long to research and learn your favorite tunes? Would you enjoy being able to play 50, 75, or even 125 of the greatest rock songs of all time? The Ultimate Guitar Song Collection DVD courses are now available. Think of them as your "fast-track shortcut"
If you're just getting started on the guitar, this is actually the PERFECT course for you, because I include a full hour of instruction even BEFORE the songs, to teach you the basic chords and get you up and running as fast as possible. "Volume 1" by itself is a monster course, with over 5.5 hours of instruction on 4 jam-packed discs. So you get the basic beginner lessons PLUS the mindblowing repertoire of 75 of the greatest songs of all time. But first, let me introduce myself in case you're not familiar with me and my work. 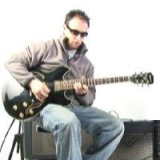 My name is Claude Johnson and playing and teaching guitar is my passion. I've played in bands, recorded in studios, and learned from legends for the past 20 years. And more importantly, I've helped tens of thousands of guitarists play all their favorite songs on the guitar with my simple and straightforward "1-2-3" guitar method. 1. Learn the basic chords. 2. 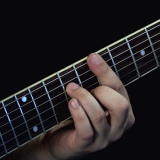 Put those chords together into chord progressions. and BOOM -- you're playing a song! Maybe you're thinking it can't be that easy and simple, but IT IS ! 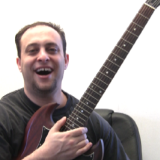 I've already sold thousands of copies of my original Ultimate Beginner's Guitar Course that shows EXACTLY how its done. Even better -- I just totally reshot a whole new version of the course in the studio with multiple high-def cameras... It's totally "pro"! I'm very proud of the production values on this as I teach you 75 of the all time greatest tunes. AND... then I went "above and beyond" and shot 50 MORE SONGS to create volume 2 in this fantastic series. 1. You're getting only the best songs. These tunes are the best songs from the greatest bands and artists of all time. One look at the artist list and I'm sure you'll agree. 2. You get crystal clear, step-by-step instructions. First, I'll make sure you know the chords. 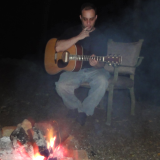 Most songs use the basic open chords or barre chords that I go over before anything else. When there's new chords, I show them to you and tell you the exact fingerings. No guesswork. fun and exciting for you. 3. You get the exact strumming patterns. 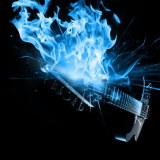 guitar playing will be on fire!" I'll also teach you the exact strumming patterns you need for each tune. I admit, this was one of the shortfalls of the earlier version of the course... however I'm proud and excited to have upgraded this aspect of my instruction. 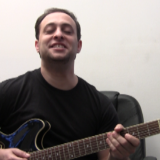 I break everything down and explain every rhythm in detail so that you can absolutely master the strumming. 4. You'll learn simple, yet effective arrangements for each song. It's one thing to know the chords of a song, and its another to actually play a convincing rendition of the song in the real world. The good news is, you don't have to! I'll show you how to get a great sounding version of all of these songs with just you and your guitar. For example, I'll tell you where you need to simplify a complicated riff into a basic 2-chord progression (and how to do it). I'll tell you where to switch up your strumming pattern to create dynamics and make things sound great. I'll show you what to play on the guitar even though the original song might have featured a piano. Basically, I've done all the research on every tune and I'm ready to give you step-by-step lessons and everything you need to know. Best of all, these arrangments are a perfect balance between simplicity and effectiveness. We'll stick mostly to rock-solid, great sounding chord strumming, yet we'll also break out into slightly more complex playing when we need to, to capture the magic of each song. with your friends and family." 5. You get easy-to-follow chord charts and tabs. I've created professional chord charts with nice, easy-to-read, big block letters. So following the chord progressions will be easy. Plus, with the way I've broken everything into neat little sections and laid it all out symmetrically, I think it will really make it a lot easier to memorize these songs too... So you can play them anywhere you go. 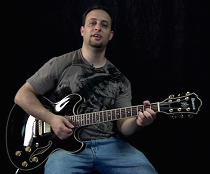 Yes, I try to keep the arrangements simple, and use chords as much as we can, but we still will play some single note lines, powerchord riffs, picking patterns, and other effective techniques. So when I'm not giving you a chord chart, I'll give you the exact phrases you need to play, tabbed out note-for note. 6. You'll thoroughly enjoy these lessons. I think you'll have a blast learning these tunes. Of course, being able to play the songs will be a thrill, but I'm also talking about the learning process itself. These are all my favorite songs and I'm betting most of them will be your favorites as well. These DVDs are the closest thing to me coming over to your house and personally showing you all these great songs. In fact, in some ways its even better because you can pause, rewind, and watch it as many times as you want. Plus you'll have all the chord charts and tabs. It's a big bundle of guitar learning joy for a tiny price. I can't think of any reason why you shouldn't buy this course right now. You know I'm gonna deliver the goods -- I've proved it over and over by creating some of the best selling instructional guitar materials over the past 10 years. Life's too short not to enjoy it to the fullest, so go ahead and reward yourself and order these sweet guitar song DVDs RIGHT NOW! I really think you're gonna love what I've put together for you here. 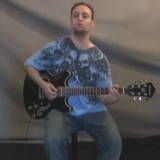 You are truly getting a truckload of guitar lessons for pennies on the dollar. I'm not exaggerating when I say that these DVDs are the equivalent of thousands of dollars worth of lessons. But you won't pay thousands or even hundreds. I've got a few super low price offers that you can take advantage of today. It's a winning decision and you'll be the proud owner of "The Ultimate Guitar Song Collection" which will reward you for a lifetime. P.P.S. Just to recap: You're getting the exact instructions to playing the greatest songs of all time on your guitar. It doesn't matter if you're beginner or advanced -- these lessons will save you tons of time and let you play your favorite songs as fast as possible.